Last January we introduced a number of achievements in Leo to make the game more interesting. 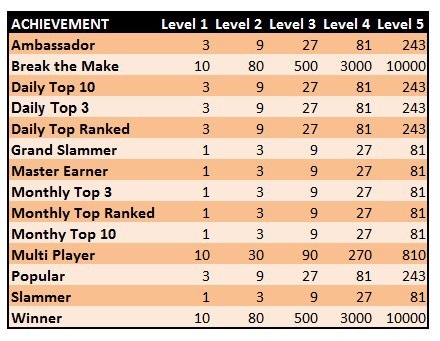 Each achievement has five levels of difficulty and it is displayed with a specific badge in the profile of each player. In the table below you may find the list of achievements in alphabetical order and the limits per level. Apart from those, we have introduced 3 more achievements that reward the Kindness of players, those who play Fast as well as those who are “Born Leaders” setting up many games. Keep enjoying Leo!